THE PARTY WAS OVER at Spurn today with no sign of such as the two Red-flanked Bluetails, Pine Bunting and Eastern Black Redstart etc but at least the putative Stejneger's Stonechat was still present in the Sea Buckthorn bushes beyond green beacon at the point itself. Still worth the late drive from Norfolk and a night in the Hotel Honda though. Even better that it was Andy Roadhouse who showed it to me! Thanks mate. Some painful buckthorn bush walking got me a bit closer but it was generally quite unapproachable while I was there. The warm rufous rump looks spot on according to the literature, as do the other features but we will know for sure once the DNA is extracted from its poo. It is amazing that Dan Branch managed to find it! Stejneger's is already split from Siberian Stonechat so it will be another UK lifer if it is confirmed by the DNA, however, there is a view that, like most things once we know more about them, this species will be accepted from field observations/photos in the future. There's no place like Spurn! 16 January 2017 Update: Well it was worth the drive from Norfolk and sleepless night in the car after all, as this bird has been confirmed as a Stejneger's Stonechat by Doctor Martin Collinson's team at Aberdeen University. However, it is ironic that the folks who ignored it and then went to Dungeness for the grey morph Common Stonechat, which was reported as having been DNA-identified as Stejneger's, should lose their tick, the test results having been mixed up with the positive-tested Spurn bird. How's that for a kick in the stones? All I need to do now is to wait for BOU to recognise Stejneger's Stonechat as a separate species from Siberian! I was surprisd to see that Lee (Evans) doesn't split it yet given the number of heavyweight taxonomists advising IOC who do. Surely just a matter of time? 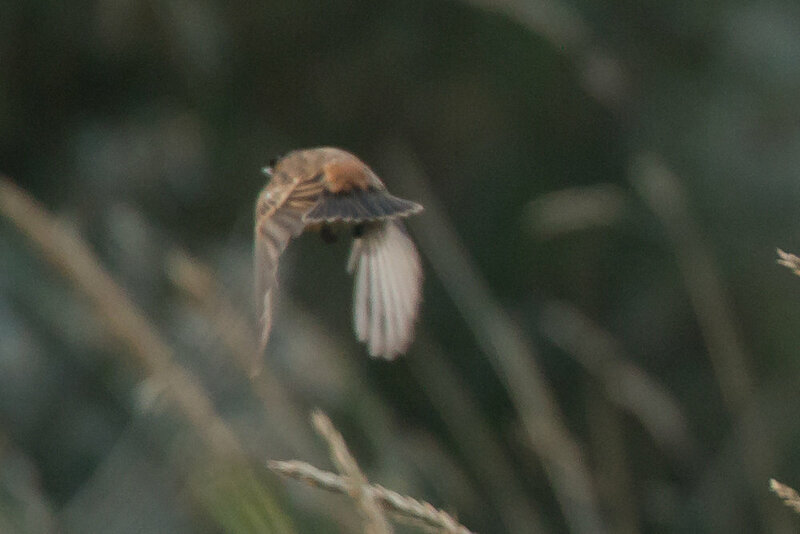 Stejneger's Stonechat - record shot of its small, warm rufous, unmarked rump.